Limit your VPN downtime to the absolute minimum! VPN Monitor IKEv2 is a status bar application to immediately reconnect a dropped IKEv2 VPN connection. The flexible ‘Always On’ VPN solution for macOS. Note: VPN Monitor IKEv2 will not block outgoing traffic while the VPN connection is down. VPN Monitor IKEv2 does not include a VPN subscription. You need to know the IKEv2 configuration details from your provider or have a .mobileconfig file available to configure the connection in VPN Monitor. The App gets notified of changes in macOS network connection status and immediately takes the required actions. Its efficient connect, reconnect and fallback approach ensures carefree operation. There is no CPU intensive ‘status polling’ involved (as in AppleScripts or other Apps). ►►► Is my IKEv2 account data secure? It is not possible for an App to start or stop an IKEv2 service it does not ‘own’, hence it is required to enter the IKEv2 account information in VPN Monitor. This information is safely stored in a VPN Profile under ‘System Preferences > Network’ and passwords in the macOS KeyChain. VPN Monitor is a trusted and notarized App, your IKEv2 account data is safe. ►►► What’s the difference with VPN Monitor? VPN Monitor was released in 2014 and supports macOS 10.9 and upwards. The App will remain available to provide support for older systems, but is unable to reconnect IKEv2 VPN services. 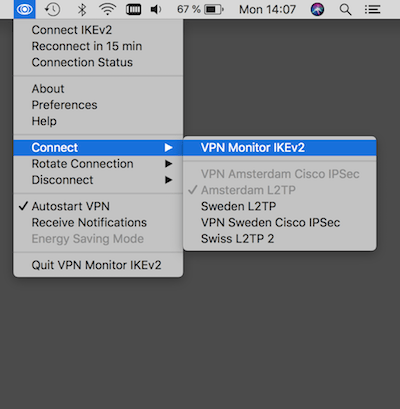 VPN Monitor IKEv2 supports macOS 10.11 and upwards and is able to reconnect IKEv2, L2TP and IPSec VPN Services. ►►► Why is VPN Monitor IKEv2 not available in the Apple App Store? The App Store only allows IKEv2 Apps written by software companies. Fortunately there are solutions available outside the App Store such as Paddle, which provides similar functionality for developers and endusers. The order process is conducted by our online reseller Paddle.com. Paddle.com is the Merchant of Record for all our orders. Paddle provides all customer service inquiries and handles returns. Precisely what macOS has needed since the introduction of native IKEv2 VPN support! Keeps me connected all the time and reconnects quickly if I get dropped from my office VPN. Great tool that’s worth the small price to avoid frustrations and wasted time.